Do we really care why a bully bullies? Yes and no. On the one hand, it doesn’t really matter. The experience of the victim of bullying is the same regardless of the reasons why a bully bullies. Whether a bully bullies because they are insecure or because they are a sociopath doesn’t really matter. The way to get a bully to stop isn’t impacted by the reasons why bullying is happening. Bullying is largely a behavioral problem and behavioral management techniques work really well to get it to stop. For instance, if a child came to me and asked for help with bullying, I would not ask them why their bully was bullying them before offering to help. Why? Because it doesn’t matter in this context. It is not the victim’s responsibility to psychoanalyze their bully. And … help for a victim should not be predicated on whether or not they correctly analyze the reasons their bully is bullying them. And yet, the first question out of the mouth of just about anyone, is why did the bully do that and what did you do to get them to act that way? This is victim blaming. I experienced the same thing the first time I reported being stalked. I reported that I had received over 300 phone calls in one month by an ex-boyfriend and the officer taking the report asked me why my stalker had called me so many times. My answer? I have no idea, why don’t you ask him! What was really annoying is that this question was totally irrelevant to my situation. It didn’t matter WHY he was calling me so often. What mattered was that calling someone you hadn’t seen for 2 years 10 to 20 times a day after being asked not to is totally inappropriate regardless of your reasons! Our focus on why bullies bully often prevents us from just dealing with the inappropriate behavior as inappropriate behavior. We get so caught up in the psychoanalysis that we paralyze ourselves. We should, instead, be dealing first, with getting the inappropriate behavior to stop. Asking a victim of bullying (especially a young child) to justify why someone else is behaving poorly towards them before we are willing to help them puts the onus on the victim where it doesn’t belong! The victim’s only responsibility is to adjust their behavior to discourage bullying and to report what is happening consistently. What a victim of bullying needs from others is training on how to adjust their behavior to discourage bullying and for the person they report things to do take direct and appropriate action as a result of these reports. Now, given that why bullies bully doesn’t really matter to their victim, doesn’t mean that why a bully bullies doesn’t matter at all. It does matter to the person and people responsible for making sure they stop. The behavioral management techniques that are used to control unwanted behavior like bullying are only effective when the behavior is under conscious control, meaning, the behavior can be chosen. If the behavior is instinctual, it can’t be chosen or not chosen and if it can’t be not chosen, it can’t be eliminated. Additionally, bullies do have a variety of reasons why they bully. Some bully for power, some bully as a way to deflect attention or to attract attention through bad behavior. Others (probably a very small number) engage in abusive behavior as a result of mental illness or other disorder that prevents them from choosing more socially appropriate behaviors. To successfully eliminate bullying, the person charged with eliminating the behavior, has to figure out WHY, out of all the possible reasons why a bully bullies, this particular one is. And they need to figure that out in order to know what sort of interventions will work to get the bully to stop. And unfortunately, that requires a bit of trial and error. The good news is that the behavioral approach (using operant conditioning) to train a bully to stop, should work for the majority of bullying situations. It will also help identify those situations which are beyond operant control and that will require further more intense intervention. So, do we really care why a bully bullies? Yes and No. 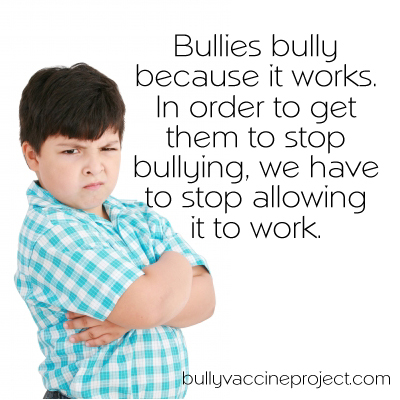 Yes, as we need to consider bullies compassionately to help them receive the interventions they need to stop bullying. And no we don’t because what we need victims of bullying to do is going to be the same regardless of the reasons why.